A trader seeks the man responsible for selling the guns used to kill his brother. If you're a fan of the western genre and the work of Mann and Stewart within its parameters, Eureka's blu is an essential purchase. If you're not, you may well be after giving this somewhat unsung gem a watch. 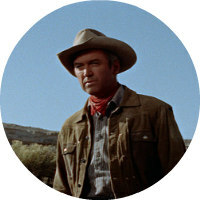 Most movie lovers are familiar with James Stewart's collaborations with Frank Capra and Alfred Hitchcock, but the filmmaker he worked with the most was Anthony Mann, for whom he starred in a total of eight movies. Five of these were westerns, culminating with 1955's The Man from Laramie, now available on blu-ray in a stunning 4K transfer from Eureka Masters of Cinema. In Mann's westerns, Stewart was known for essaying troubled anti-heroes. Here he's Will Lockhart, a former captain of the Union Army now eking out a living as a trader while searching for the man responsible for selling guns to the tribe of Apaches who killed his brother in an ambush. This leads him to the town of Coronado, where he runs into the Waggomans, the family that own all land "for three days ride in all directions." The first Waggoman he encounters is Barbara, the pretty proprietor of the town's mercantile store. After some polite flirting, she tells Lockhart he is welcome to help himself to salt from a local flat, but while shovelling the salt with his crew, Lockhart is attacked by Barbara's cousin, Dave Waggoman, who lassos the trader, dragging him through a fire, burning his wagons and killing most of his mules as a warning to leave Coronado. Lockhart refuses to give in to such unreasonable demands and heads to the Waggoman ranch where his attempt to beat seven bells out of Dave is interrupted by the flying fists of Vic Hansbro (Arthur Kennedy), the foreman of the Waggoman ranch. Dave's father, Alec Waggoman (Donald Crisp), the patriarch of the town, pays Lockhart for the loss of his wagons and mules. Remaining in Coronado in the employ of rival rancher Kate Canady (Aline MacMahon), Lockhart begins to suspect the Waggomans may have played a role in his brother's death. Stewart was as gripping as an actor as he was charismatic as a movie star, and in Mann's films he was called on to display both attributes. When we're introduced to Lockhart initially he's the 'aww shucks' Stewart audiences expect, but after the attack by Dave Waggoman he morphs into the tortured, angry Stewart fans of his work with Mann recognise. There's no more troubling sight in cinema than seeing an upset Stewart, the twinkle in those blue eyes washed away by repressed tears, bloodied lips refusing to flash that winning smile. 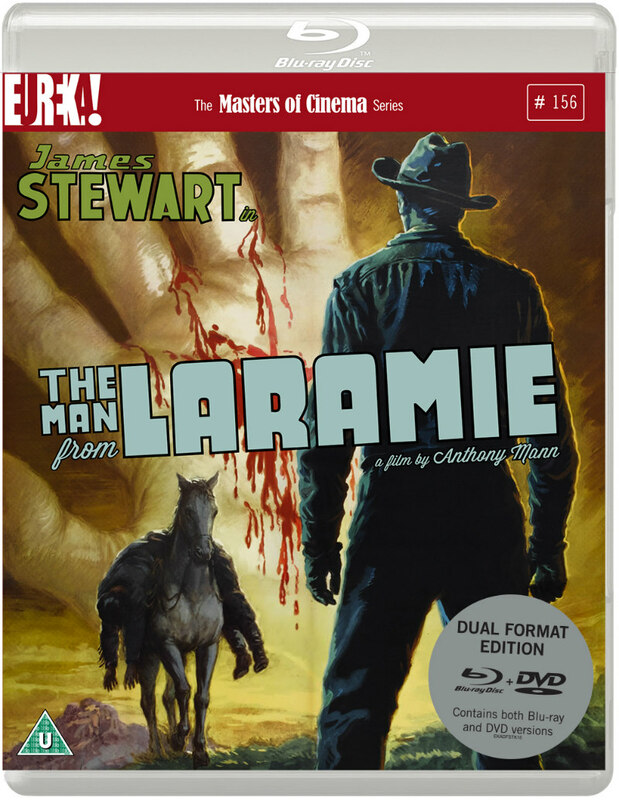 The Man from Laramie features a then unprecedented moment of violence in which Lockhart is shot point blank in the hand; Stewart's reaction is haunting, not just for the physical pain he's suffering in the moment, but for the wound's psychological effect - there's no turning back at that point. Mann's previous western collaboration with Stewart, 1954's The Far Country, had employed a 2:1 widescreen format, but here he opens up the vistas further with 2.55:1 Cinemascope, one of the first westerns to use the format. Mann exploits the format with some beautiful compositions, making the most of the film's outdoor settings. Thanks to this crisp blu-ray transfer, we can now fully appreciate how Mann uses the depth of his frame, threats appearing far off in the distance that were previously lost on DVD and TV prints. Critic Adrian Martin provides a commentary track while the always watchable Kim Newman is interviewed for his take on the film and the western genre as a whole. A trailer and booklet round out a decent package. 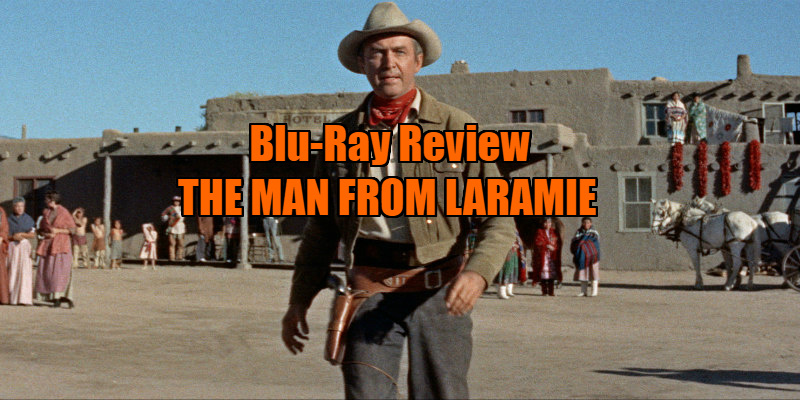 The Man from Laramie is available on blu-ray now from Eureka Masters of Cinema.